Project Oriented Training Camp is an annual training programme, conducted by Swecha that improves students learning capacity with a team driven environment. This year, the theme of the camp is Data, Devices, Design, Develop. We aim to train and equip the participants of Summer of Data with cutting edge technologies. Going beyond simple technology introduction with assignments, the camp provides an integration system that consolidate technology learning through completion of a team project. Mentors from industry will guide students through these projects. This is a 30 day residential camp held at a campus for all the students at MLRIT Hyderabad. The participants will also have games, impact sessions, team building activities etc., along with the technology. By this way, Swecha incorporates personality skills inclusive with technical training. 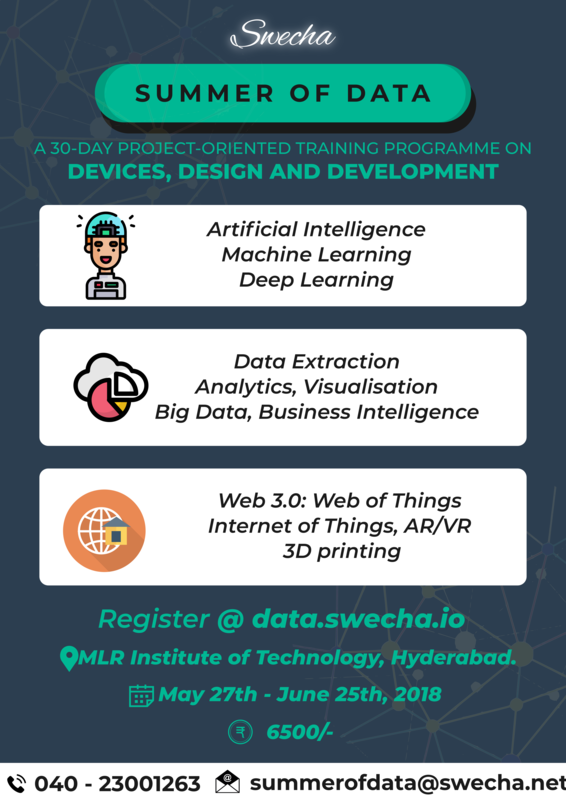 In the long ­run, Swecha aims to make aware the participants about the alternatives to the proprietary tools and also make them a part in contribution.